On any trip that is longer than two days, I like to bring at least one dutch oven. They may not go along if we are going to be travelling a lot but we usually stop to set up camp in the afternoon and that allows plenty of time to get an oven going. Just wondering how many others do the same. Dutch ovens make for some great breakfasts and dinners. Mine are not the healthiest of meals but they sure do hit the spot. I just purchased some smaller ones for my vic supported excursions. One size for one or two people (2 qt.) and a larger for when there are 4-5 (8 qt.). I have larger ones too but they usually stay close to home. We have two, and often bring them along on trips where we'll have time to use them. The classic mountain man breakfast is a favorite on leisurely mornings in camp, and makes for some great breakfast burritos. We've found you can be pretty creative with the right sort of leftovers from the prior night's dinner. I've also adapted several cobbler recipes from home for use in the DO on the trail. Tasty treats! My dad always takes them everywhere, even just on day trips out to the river or to picnics in local parks. Me though, I usually will take one out if I'm planning on spending more than a couple nights somewhere. Its nice to cook a big breakfast in them and then have leftovers for lunch. And if there are more than just me and one or two other people I'll bring one along and make chili or cinnamon rolls or something to share with the group buffet style. All this dutch oven cooking is making me hungry . 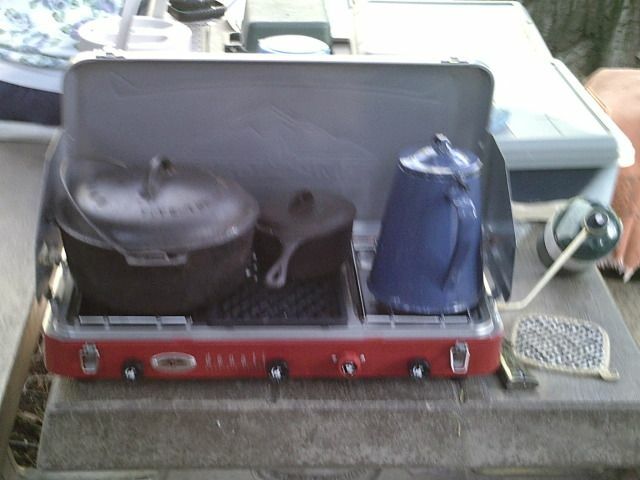 We bring it on all camping trips, although heavy, it makes some great meals. There are many recipe books out there for dutch oven cooking, what are some of your recipe favorites? or made up ones? at last count I had fourteen dutch ovens with sizes ranging 4" to 12" in varying depths. I am not a real heart healthy cook but the meals seem to disappear. Oh yeah, you definately need to be going on the Old Iron Run. I am going to bring two. A small one and maybe a 10" or 12". I do enjoy an easy DO pizza. Not a recipe but my dutch oven pizza is a quick and easy dish. note - meats for pizza can be pre-cooked before leaving home. A salad and favorite red wine and you are set for dinner. An ExPo member, Joanne, is active on a dedicated 'Dutch Oven" forum. I've surfed into their discussion board through a link from her and swiped quite a few recipes. They're a friendly crew and are very helpful when it comes to advice. I'm fairly new to the Dutch oven world, I'll take it if it's a trip at least 2 days at the same camp, I don't bother if se are moving camp ever night, I'm not great at cooking with it yet. Need to pratice then I might take it every trip. I can see a back country dutch oven gathering coming together some time in the future. Excluding the size and space that a DO needs, they are a perfect match to back country travel. As one of the earlier posts stated; there are a lot of DO groups out there and they all list lots of recipes. We travel a lot with our teardrop (a pavement pounder) and when we stay with tearjerkers we always see lots of other folks cooking with DO's. They really are fun to cook with. If you like DO pizza for dinner you should try one of the many DO recipes for DO breakfast pizzas. My favorite uses tator rounds for a crust, a good spicy breakfast sausage, eggs and of course lots and lots of cheese. I don't think I can recall a trip where I did not take a DO. I am so bad that I even take a hybrid one when I go backpacking. When I was in scouts I was introduced to the pie tin DO. Fell in love with the concept of being able to backpack and enjoy my favorite DO meals. There is nothing like a deep dish pepperoni pizza after a long day of hiking.